Are there really right answers to big questions about God, faith and truth? The kids of Odyssey are about to find out! Can the Science club discover the reality of Intelligent Design? Will Captain Absolutely triumph over the evil schemes of Dr. Relative? And what happens when kids are in charge of their own city . . . with no adults! There’s absolute adventure ahead with these life-changing stories on seeing the world from a Christian perspective―and that’s no lie. 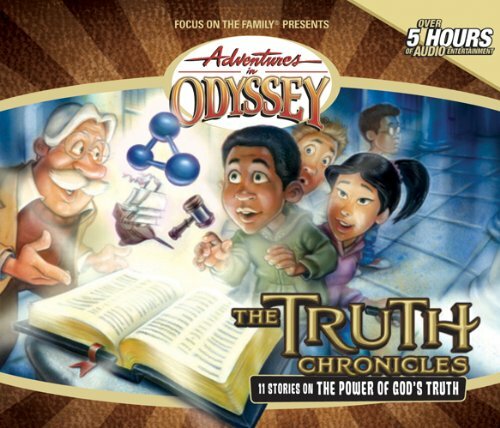 Inspired by Focus on the Family’s The Truth Project curriculum, these 11 new stories include themes such as a Christian Worldview, False gods, Government and the Bible, Absolute Truth, Intelligent Design, Compassion, The Founding of America, The Trinity and Natural Order. Includes 16-page booklet with questions for family discussion. Also includes “Kidsboro” audio drama, which introduces a new kids-only neighborhood in Odyssey. If you have any questions about this product by Tyndale House Publishers, contact us by completing and submitting the form below. If you are looking for a specif part number, please include it with your message.